Hi everyone, on a calm sunny evening here at the Clubhouse on Langara. We have just concluded our culinary trip and things are all good here on the island. Our last trip saw 8 tyees, largest aboard Pred. 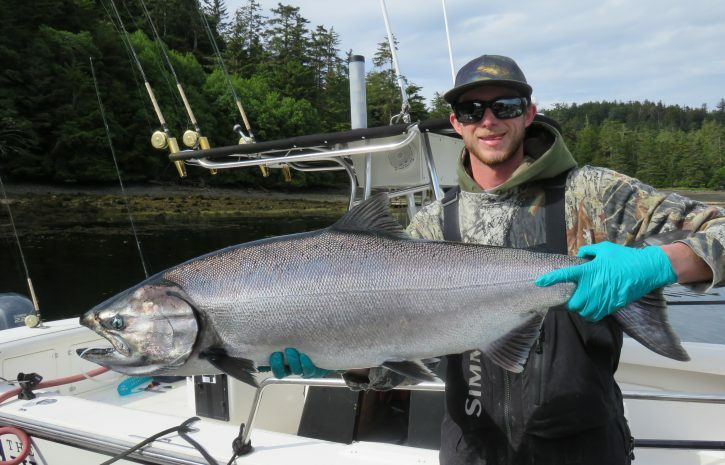 2, J.B. Rupert on the rod, a released 43 lb tyee. This fish was taken in Mutton, one of Buds favourite locations, and he visits Mutton often. The bay is stacked with feed and whales, and does look fishy this year. Runner up fish was a released 40, for Don Ritchie, fishing on boat 6 with Korey, this fish a Reef fish, well done. 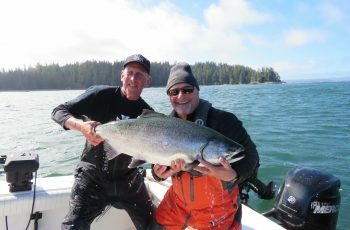 Terry David Mulligan snuck a tyee in , a 32 lb fish out off Boulder, angling with the Hawk, Terry telling me the fish almost spooled him to David got the boat around and chased her down. 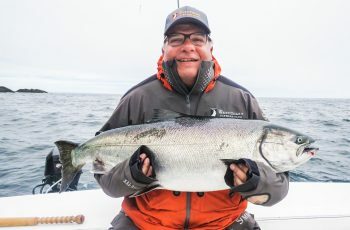 Terry fished with me many years ago in Rivers Inlet at the Sportsman’s Club, landing a 49 lb chinook on a brand new rod, my trophy xl yellow moocher, wow have times changed. 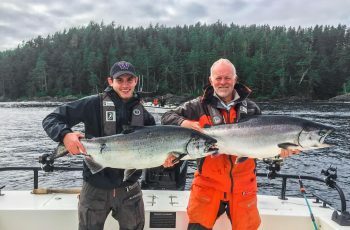 I fished with Don Elkington and Glen Hanlon and we worked extremely hard to find a 33 ln tyee in Bruin Bay, 5 pm on the last evening, wow that was close. 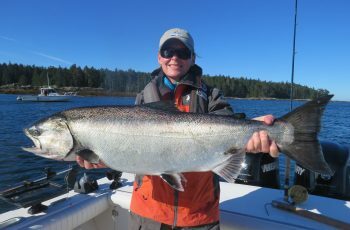 We had a 26 ln chinook at Lacy for Glen, belly hooked and sealions hunting our fish down, lucky on that one. We lost a lunker in the am in Bruin, and that was it for the day, 3 chinook, slow for us. The chinooks of size are around though, NIL had a 54 release yesterday at the Reef, and a 62 was angled two days ago on the REEF, also released, way to go Beaver and his unknown guests at this point. As a matter of fact 8 over 40 were angled in the pass on the 25th! Today I found slow again, with zero tyees here at the club. So off halibut fishing for the Screamer, what a way to spend an afternoon. I headed out with guests Bruce Staszack and Peter Woolf. We got out there in decent conditions, a sideways slop and chop, nice! No tide so down we dropped and waited and waited…where were they? After an hour Bruce bulldogged a 57 up from the bottom, and bruce also grabbed a Pocket Ling, about 18 lbs. Then nothing….we waited another hour and Peter cranked up a 45 to 50 lb ling, no pocket this one. We had a look at her and set her free, a big old female, well done Peter. Now two hours later, after a major Tsang bait job, we latched into a double, one taking lots of line on the shiny new Avet….Peter had his hali. Grind and wind, come on Peter, I want to go back to shore, I hate it out here! Peter, buckled down in his coat, looked very warm…and cranked a 101 up to the boat, where myself and Bruce rodeo,d the fish into the boat, thanks Bruce, saves wear and tear on me, well done. This is where the fun begins. This is the injury report for July 28. For some reason I decided to remove the hooks, A Kenny Wang stinger hook setup, while the halibut was still alive. 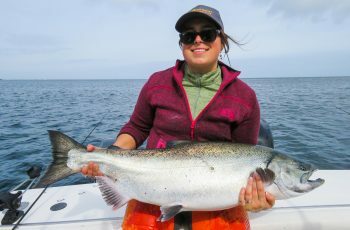 One minute smiling, one minute pinned by my finger to a bucking halibut at 100 lbs. The blood gushed as i became light headed, warm shots of blood hitting all parts of my 27 foot whaler. I was pinned and need a knife and pliers quickly. Keep cool, settle down, now what to do. Had Peter cut me free from the halibut, dammit that hurt. I still had a hook in my finger to the bone, hmm gees, that’s a lot of blood. I stumbled to my bow and grabbed some alcohol, yes time for a drink, this is going to hurt. Options included driving back 12 miles to camp with a salmon belly attached to my finger, and a hook pinned to my bone, or ripping that mother….out. So one more swig of booze and I sank my hand in the water for freezing and grabbed the shank, closed my eyes and ripped…one large rip and yank, she popped, had my finger free of a nasty 8/0 hook. Dizzy but feeling lucky, contain the bleeding….hmmm jammed on a rubber glove…a marigold, on my paw and pinned the boat for the barn…wow what an great adventure. Glove chalk full of blood but hey, about Knox she clotted and I was feeling almost human. Greeted at the dock by Bryce and Matt, they bailed me out and took care of halibut and anchor, thanks guys…I was on wash down duty, what a mess. Guests were very helpful, Peter cut me free so a big thanks. So you want to go halibut fishing eh? All our boats did well, Conman, Jordie, Kui had the two fish limit, as did the Lacy team of Pat and the 22 foot crew. So up the hill for patchwork, might get the pic posted on the blog one day ha-ha…thanks to Kingpin for the ride up the hill and Alex for the first aid. On the injury list, day to day, will be in the game tomorrow. Korey has gone down, Four weeks with a suspected cracked shoulder, early yet, but sources say he could be back before seasons end. He is a tough kid, raised in the Charlottes, proud operator of Boat 6, the big 27 outrage, if anyone can pull off a recovery it is Korey, and the crew of guides miss him already, as do the guides next door at LIL, all asking me to wish him the best….he is a big part of this team. As most know, Korey is a top fisherman and a big part of team Scream as well, and I certainly wish him back sooner than later, a valuable first line player on our dock! I can tell you all that John Wayne or Rambo got nothing on Mike when it comes to Mans Town. Here is the Short version of the story, Mike jumps onto 100lb bucking hali, it was like watching a event at the Calgary Stampede, STEER WRESTLING comes to mind, it was all good until the hali does a buck with a twist and bang Mike is hooked, and the hali is getting ready for round two, Mike calmly tells me where to find his knife while he exerts more pressure on the hali’s back, I find his knife, no he says I have a sharper one over there, I come back with the sharper one, he tells me where to cut, at this time he hasn’t even raised his voice, I free him from the bucking hali and we all stare at his finger with a hook clear through it connected to some line, and another hook with a ball of guts hanging off of it, once again Mike instructs me where to cut , once that was done were down to just the hook and impaled finger thing, as Mike said he has a shot of Booze ( a sip of beer, too funny ), this is the fun part for those of you that can recall what the Duke even sounds like, but imagine him saying “ I gotta take this hook out,,,,, and then we will pull anchor,,,,, and be on our way…..pilgrim” and that’s what he did, Bruce and I were pretty amazed, would be fun to tell you all we know why they call him Screamer but that would be a lie. Hey Mike thanks for the adventure and one great fishing story! If you get a chance please send the pic’s of the Ling we put back. Ps. Three trips, and so far three great guides, Pat, Han’s and now Screamer! injury report…Tanner Smith back issues, 15 day disabled list, NIL!